"Bernard Ecclestone, the British billionaire who has monopoly control of grand prix racing licenses, wants $25 million a year to allow a race in Austin — a cool quarter billion if the races continue for a decade. You can get an idea of Eccelstone’s riches, held mostly in tax havens, from the third home just acquired by his 22-year-old daughter Petra (pictured). She just bought the 57,000-square-foot home of the late television mogul Aaron Spelling, according to The Wall Street Journal. It was listed for $150 million. Petra also owns a $91 million London residence. So Texas has oodles of money to pay as a fee for a car race, but is so broke it must fire thousands of school teachers? This is sound government policy?" There's the usual claptrap from Austin about how such subsidies would bring jobs and economic development to the region - claptrap that Johnston demolishes comprehensively. 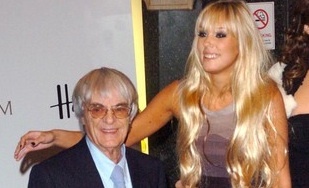 Ecclestone's contempt for democracy is quite explicit, it seems. You can see this from some comments he made not so long ago, which caused outrage at the time. "(Hitler) brought a country that was bankrupt into a country that was very strong and that was really demonstrating what someone could do if they had the power and didn't have to keep back and referring every five minutes," said Ecclestone. I regret that it didn't come out like that, upsetting people is the last thing I wanted to do, obviously. . . . Mr Ecclestone, 78, said he was being positive only about Hitler's leadership of Nazi Germany between 1932 and 1938, adding: "After that the guy was obviously a lunatic." What Ecclestone has is something that Fifa and the Olympics share - they control a monopolistic 'one-and-only' venture (Formula One; the World Cup; the Olympics) that creates possibility of what economists call rents - 'the income of men who love to reap where they did not sow.' You can tax rents up to 99 percent and capitalists will still pursue the activity - since a 99 percent tax on free money is still money, isn't it? Free money of this kind, as Fifa has recently demonstrated, generates not only corruption, but contempt for society, and a sense of impunity - living above the law and democracy and so on. "The rest goes to a company called Delta Topco and to its subsidiaries (see graphic), which handle the organization and marketing of Formula One. The owners of Delta Topco -- financial investor CVC Capital Partners, banks and Ecclestone and his family -- are the real beneficiaries from the global racing circus. The 500 million TV viewers in Japan, China, South America, Europe and the Middle East are almost completely in the dark about the large deals being made, which are often handled using tax havens. The money is often funneled through companies headquartered on the Channel island of Jersey, a place of great discretion and low taxes. According to the study, a number of companies in the Formula One empire that are based in England have taken out large loans at 15 percent interest from the subsidiaries in Jersey. As a result, the companies in Jersey post high earnings, which are only subject to the Channel island’s low tax rates. In return, profits are reduced for the companies registered in Great Britain, which pay higher taxes. Offshore. It's infected everything. It's everywhere. If you want to regard offshore as the root of all ills.. well, you may be right and we should look at some enterprises in this light. First, let's look at the obvious scam that's welfare reform. In this guise money is routed from the public purse into private pockets to an international company, ATOS. guess where it goes then? Think they pay a lot of tax here in the UK where the taxpayers accumulate the money in the first place? Don't think so! Same kind of deal with the wind-farms, all these electric-generating windmills don't really generate electricity so much as money again is taken from the public purse and finds its way offshore again where we don't get the benefits recirculated back into the system. we're being bled dry in this country and it's our elected representatives who are helping to do it!